Hello Scotland Tour Families, Chaperones, and Staff! Did you know we leave for Scotland in 178 days? Yup. Today is the first of many deadlines we will have before boarding our flight on July 28. We built in cushion around this deadline but not much. If you haven't taken care of the items listed below, you still have time but please do not delay. Every deadline going forward, however, is firm. Thank you for paying attention to these details! The purpose of this registration process is to collect, in one place, all the necessary information required for ticketing and to provide to the US State Department prior to our departure. If you have already registered, please double-check your entries to ensure everything is accurate! Your registered name must match your passport exactly before we issue tickets. 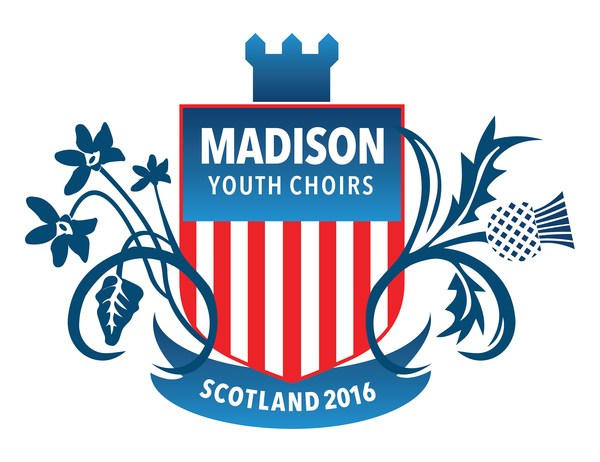 Singers under 18: A parent or guardian is required to complete the User Registration. DO NOT check the box “Also register me as a passenger on this tour.” Once your User Profile is set up (after agreeing to Terms and Conditions) you will have the opportunity to “Add a Passenger” and complete the information required to register your singer. Chaperones, Staff and Singers 18 or older: Set up a User Profile in your name and check the box indicating you are also a passenger. Agree to the Terms and Conditions and Proceed to the Passenger Profile questionnaire. Most of the Passenger Profile questions are straightforward. If you have questions, please ask. Ignore the “Land Only” language. This does not apply to us. Enter Frequent Flyer Number, passport info, etc. Year in School: please record the year in school for fall 2016. Dietary Needs: This information will be communicated to KLM. Dietary needs will also be communicated to MYC at a later date for festival dining. 2. Passport information recorded on Gateway site by February 1. Everyone should have their passport by now. Please make sure your Gateway record includes your passport number. If you have not yet applied for your passport please go to the state department web site to get started TODAY. Please note: your passport must be valid through February 8, 2017, six months beyond our return date of August 8. 3. Additional Passport photo due to MYC by February 1, 2016. The Festival will be issuing all participants (including adult chaperones and staff) a photo ID. For this they will need a passport photo from each tour participant (singers, chaperone and staff). Most passport photo services provide double the number of photos needed so we are hoping most of you will simply submit your extra photo to MYC. (You will get it back if desired.) Please forward your photo to the MYC office ASAP. These are the sizes provided by the festival--we have no control over the sizes being offered. Please make your best choice based on the options provided. Numbers in parenthesis indicate chest measurement. If you are planning to travel with your singer after the festival, you must complete the deviation process with Gateway by April 25, 2016. Please start this process today! A deviation is any change to your singer’s return ticket and is allowed on the return flight only. There is a $50 deviation request fee and fare increases may apply. Requests must be submitted, completed, and paid in full by April 25, 2016. (This date is dictated by the ticketing schedule in place with KLM.) Deviations are handled directly with our travel vendor, Gateway, and their air consolidator. The deviation request form is available on the tour webpage and may also be found on the My Gateway portal. As a reminder, the first tour payment of $737.50 is due March 1 (followed by April 1, May 1, and June 1). Please note these due dates are firm! Tour statement will be emailed to families later this week.